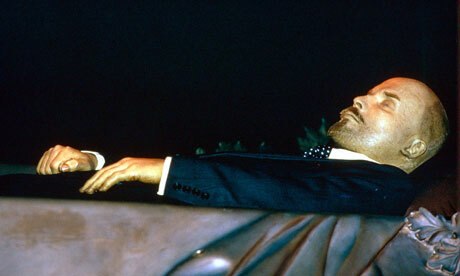 Lenin’s corpse in perpetual repose. He’s freshened up every now and then, but his is probably not the afterlife he had in mind. I kept wondering why the buses from the boat went to the Kremlin over and over again. After all, Moscow is an enormous city. But the Kremlin, which is the old walled city where Moscow was born in the Tenth Century, is not the gray place of newsreels. My childish mind likes color and clever design, and that I found aplenty. 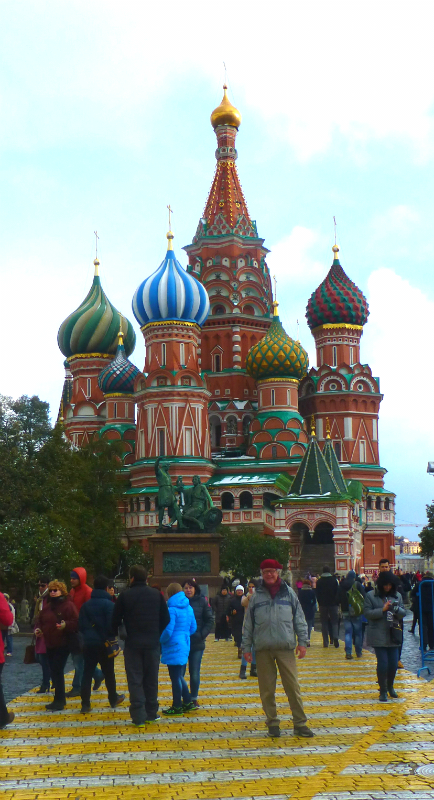 Here’s what I liked seeing: St. Basil’s Cathedral, unique with its multiple onion domes in bright colors, stripes, and other patterns. Religious temple wise, it is something the American Puritans would never do. But who said God doesn t like color? 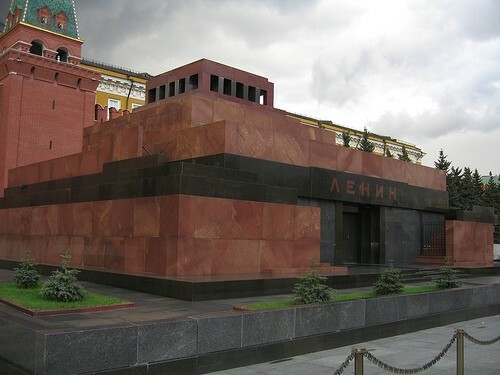 Lenin’s tomb is a black marble box from the Deadly Period (my designation) of Soviet architecture. Inside, his body is preserved and visible, re-enbalmed every now and then. Until the days of Putin, leaders would stand atop the tomb to review the troops. Putin likes to do things that look democratic. He stands on the ground. Lenin’s Tomb. Putin prefers to stand on the ground. The GUM department store is the most approachable attraction. Long a spot for market trade, it was first turned into a store by Catherine the Great. By 1917 it held 1200 stores. Post-revolution it was nationalized (GUM is an acronym for State Department Store) and was celebrated as a place where comrades of all classes could join in the pursuit of food and other things. As a state store, it was one of the few that had actual inventory, but it was also a place where people stood in long lines for bread. Built in the 1890s along the lines of a British Victorian train station, but with a curved glass ceiling tough enough to support kilos of snow, the store’s façade extends some 900 feet across Red Square. These days it is privately owned, but has again turned undemocratic. The thousand boutiques are all of the designer variety; a sensory delight of fabrics, jewels, and shoes, with price tags in six or seven figures worth of rubles. A fancy-dan food store within GUM harbored big displays of caviar and shelves and shelves of bubbly. Charcuterie, cheese, and chocolate. Tempting pastries and sushi made from fish swimming in the aquarium. This is the Russian billionaire’s grocery store. The average tourist is better off buying an ice cream cone from a kiosk, which we did. The next day, I went back for a tour of the Armory, a national museum built to contain the zillions of gifts exchanged by heads of state during the last five centuries. Like the Turks they emulated, the Russians loved big stones mounted on gold or silver and strewn about on books, jewels, and clothes. One robe for a Patriarch of the Russian Orthodox Church was so heavy with embroidered beads and gold plate that he could only wear it for a few minutes at a time. Even the horses wore diamonds on their harnesses. And much like the Smithsonian s First Ladies’ gowns, here are the coronation gowns of several empresses, all of them richly embroidered with yards-long trains. Looking back on the flagrant baroque and rococo excess of Russian tradition, it becomes especially hard to visualize the grey, minimal days of communism in this environment. In minor streets behind the great façades, there are plenty of leftover Deadly Period apartment buildings in dreary colors with peeling paint. But the new Moscow, a city of a hundred billionaires, is fighting its way through to a new level of gaudiness that is more in the Russian tradition. Great posting. Fascinating details and pictures. Gee what an interesting twist on hell for Lenin. I don’t remember Dante mentioning this possiblity. Louise should be writing travel pieces for the NYT. She’s no Maureen, which is in her favor. Yes. Then you would be paid to tell us about your adventures! As always, Louise, sharp insights nicely written. Thank you, Bernie! Think of you often as you two would love this trip. Sally, welcome to the blog! And thank you. We land in St. Pete tomorrow, and I understand it is drop dead gorgeous. Thinking of bringing home a bright onion dome for the Quintet roof. Maybe Duck colors? Would the board approve?